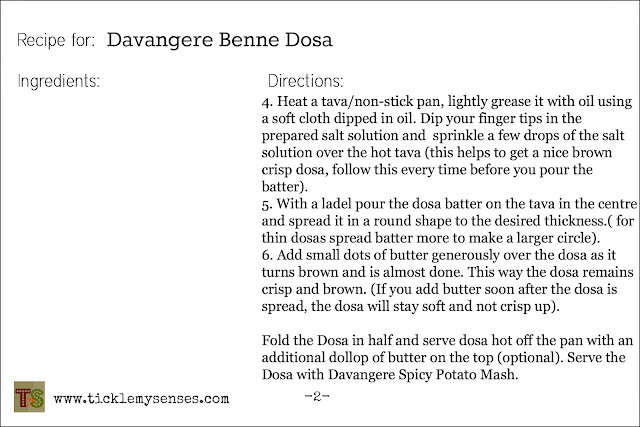 Tickle My Senses: Utterly Butterly Delicious: Davangere Benne Dosa. Dosa or Dosé or Dosai is a fermented crepe or pancake made from rice batter and black lentils. 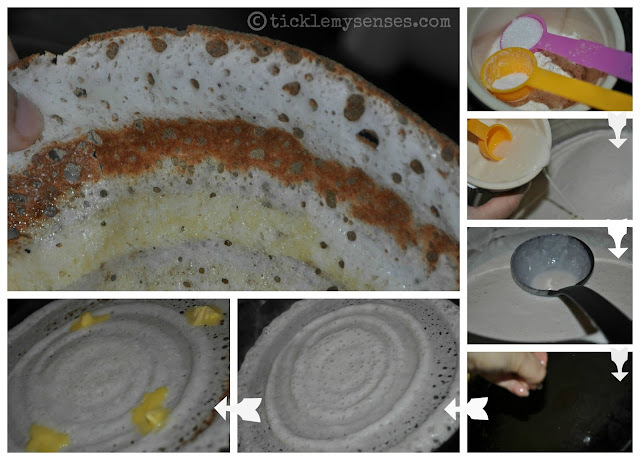 I am not much of a Dosa fan, and thats probably why you will find only 2 recipes for dosas in my collection, one being Mangalorean Panpole (Neer dosa), and other being Appams, but being a Foodie, I am willing to be converted. So when the right Dosa comes along, that actually makes me go wow!! it will go into my collection. Of the various kinds of Dosas I have tried so far ( Masala, Rava, Set, Utthapa, Mysore...) this is the only one that did tickle my fancy. Not only is it "Utterly Butterly Delicious", with a lovely crunch, but it brings back fond memories of my dentistry days in Dharwad, where all of us mates would make a trip to 'Butter Dosa Corner', and eagerly wait to be served these delicious crisp golden dosas, laced with freshly churned white butter and a side accompaniment of a delicious pale coloured potato mash flavoured with fresh ginger, coconut and green chillies. hmmmm...those were the days!! 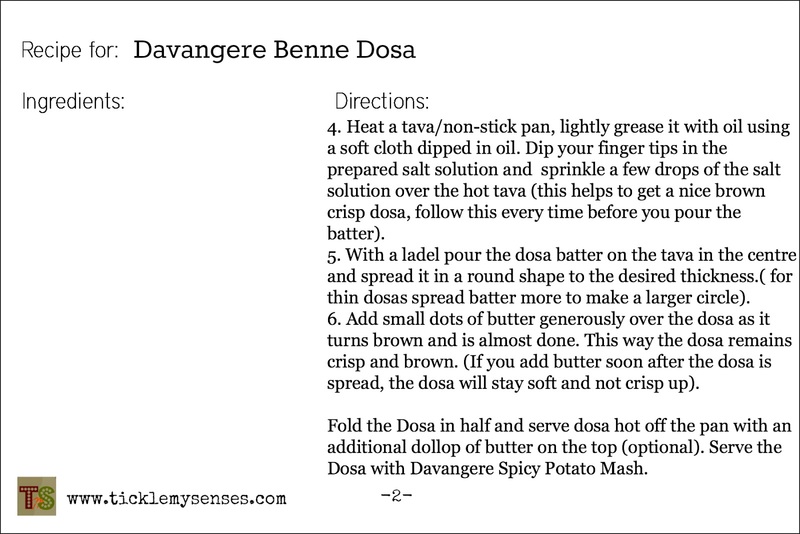 The Davangere Benne Dosa originates from Davangere (a small town in Northern part of Karnataka, India). 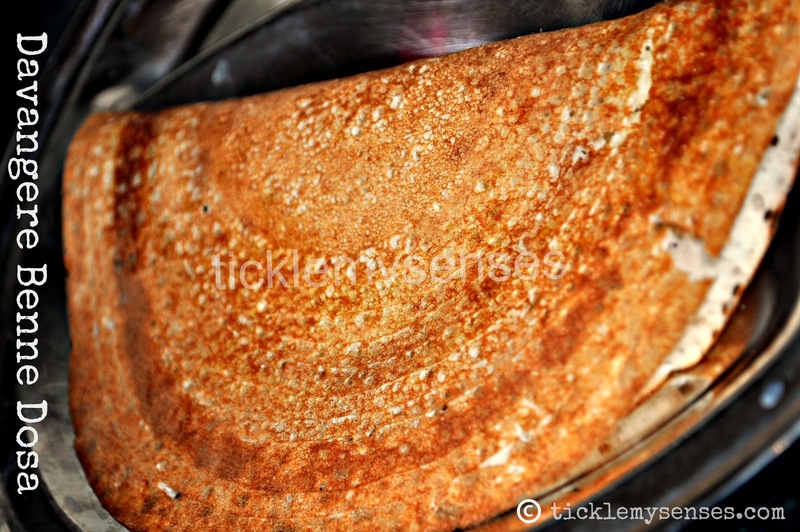 They differ in taste to the regular Masala Dosa's owing to the proportion of ingredients in its batter, and the inclusion of puffed rice and maida (refined flour) in the ground batter. The puffed rice makes the dosa's very crispy on the outside and maida gives it softness on the inside. 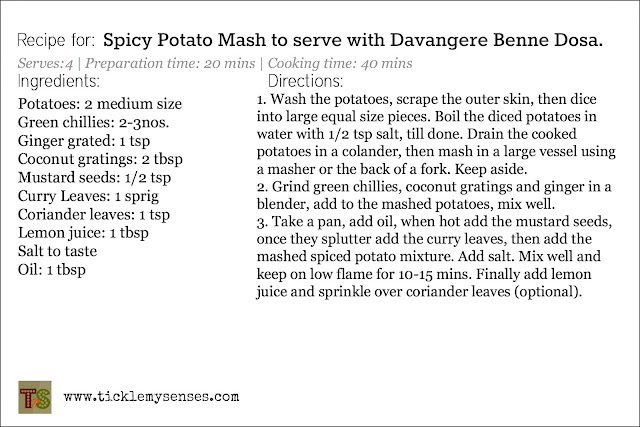 The main ingredient "Benne or Butter" gives it a nice golden brown color, a heavenly aroma and the urge to eat a ton. Ideally served as medium sized, thick and crispy dosas, I prefer to spread mine out thinner. Traditionally fried over a large cast iron surface heated by a special wood stick fuelled furnace, that gives it a characteristic flavour (I own neither, so I used a non-stick tava or crepe pan and my regular stove top:)) and results are equally good!! 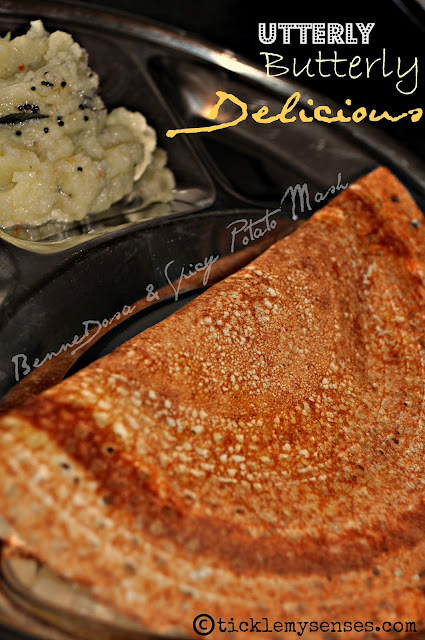 So if you are a Dosa person, dont miss this one out. Please try them, I would love to know how you enjoyed them!! They are light in texture, crispy and delightful. If you are an a post Christmas diet, skip the butter (though I promise they would never taste the same :). You could serve them with a good chutney/ vegetable or chicken stew/ curry, but if you want to be authentic serve it with the Spicy Davangere Potato Mash. 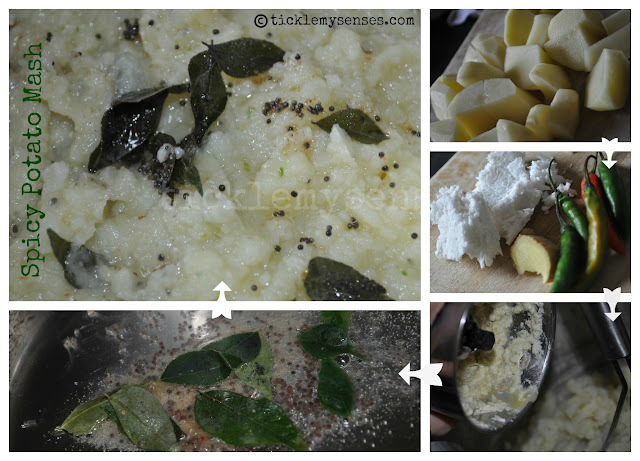 Images Below show glimpses of the Dosa making Process from Step 2 onwards. During Winter's I find the batter does not ferment very well. 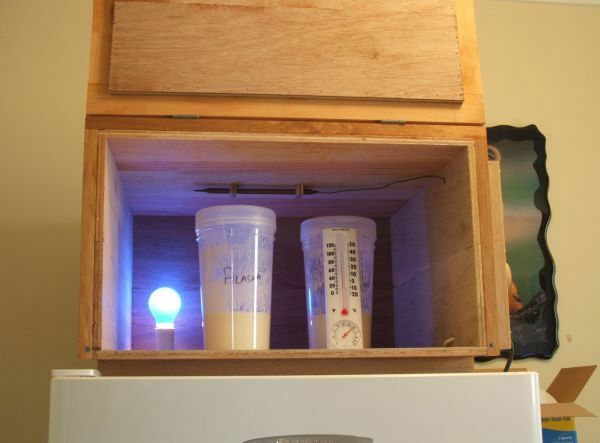 So I place the batter in a stainless steel vessel and keep it close to the radiator so that the heat of the radiator helps with the fermention. Also placing the vessel next to the cooking range when I'm cooking helps. Sometimes once I finish baking, I turn off the oven and allow the batter to rest inside a warm oven. 2. 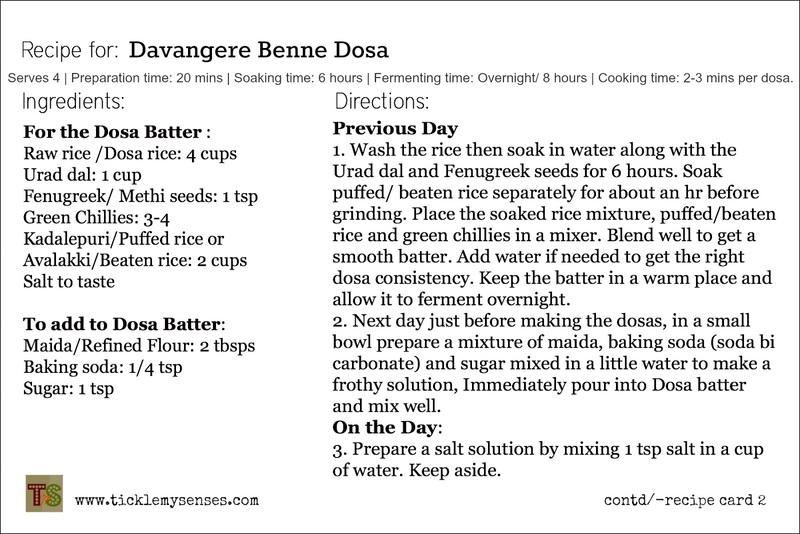 Traditionally for most Dosas, the Raw rice and Black lentils/ urad dal are soaked seperately and ground seperately, then mixed together. 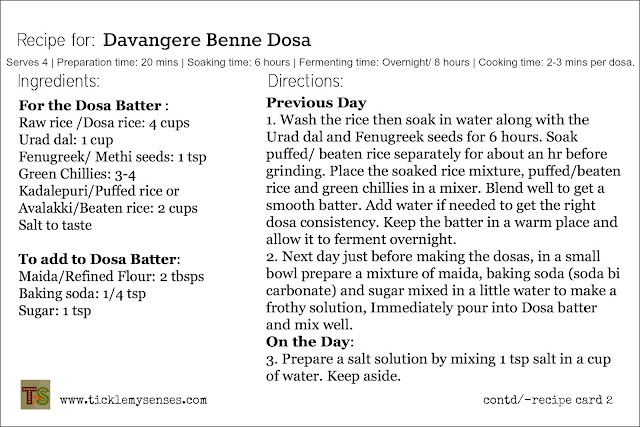 As the Original recipe for this Dosa asks for both rice and lentil to be soaked and ground together, I have followed the same above. Use your discretion and follow which ever method you are comfortable with. 3. The original recipe asks for Puffed rice, but when I run out I have substituted with beaten rice/ avalakki to get equally good dosa's. Delicious!!! one of my favs!! hi carol, nice to see u here. congrats on ur blog. its been a really long time since i knew u at SDM.